The King Baboon, or by its scientific name – Pelinobius muticus is the only tarantula of the Pelinobius genus. Mostly its colors are brown – ranging from light brown or even orange to rusty, dark brown. These kinds of tarantula have massive bodies and when fully grown can reach 6 to 9 inches leg span (16 to 22 cm). Because they are very aggressive, mostly are kept only by experienced owners and even they shouldn’t handle them. Even though it’s widely famous, it should not be kept by a beginner. They are not display kinds because they tend to stay for a long period of time in their burrows (sometimes even months). They also are nocturnal kind, meaning they get pretty active during the night and hide out most of the day time. The King Baboon Tarantula can be found in East Africa – mostly Kenya and Tanzania. It also might be found in parts of Uganda. 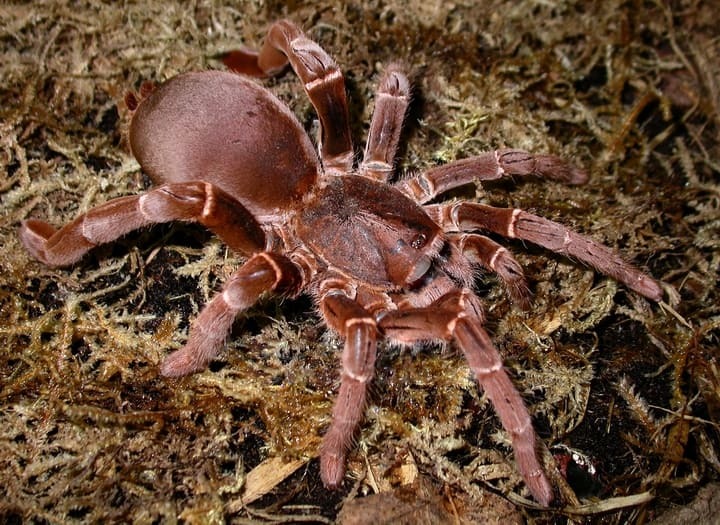 The King Baboon Tarantula is a burrowing spider that lives underground. It can be found in dry scrublands, grassland and in the roots of acadia bushes in East Africa. The King Baboon Tarantula is a carnival – they catch live preys and eat them. Mostly, their diet is made of insects, beetles, crickets, pinkie mice and even fuzzy mouse. If you keep them as a pet, make sure to never feed them with anything bigger than half of the size of their body. Like most of the tarantulas, the female The King Baboon Tarantula lives longer – up to 20 to 25 years; and usually are bigger than the males. The male ones live shorter, with a life span of 10 to 15 years. The King Baboon needs a 20 gallon terrarium and of course, a security lid on top. On the bottom there should be at least 10 inches (25 cm) of substrate – compacted sand, peat moss or potting soil. They tend to enlarge and deepen their burrows, so a deep soil is a must. You can add logs or cork bark as decorations, as long as it has enough space for its burrows to be dig. Also, make sure that they have fresh water – a wide, shallow water dish would be just fine. Pelinobius muticus – Latin name. The temperature in the terrarium should be aproximately 75 to 90 Fahrenheit (23 to 32 C). The humidity should be 75 to 85 percent (the same as for all burrowing species). The King Baboon is easily triggered and aggressive specie. They can become defensive at only a small disturbance. When preparing to attack they make a hissing noise by rubbing the hair on their front legs. Due to their short temper and nervousness, they shouldn’t be handled and a helping tool should be used when moving or feeding. Once the male has produced a sperm web, he should be carefully presented to the female. Females tend to be very aggressive towards anything that gets close to their burrow, so if they aren’t interested in mating, the male should be protected with a piece of cardboard or other tool, and taken out of the tank as soon as possible. Otherwise, hi might get eaten. After the mating, the female should be fed more often. After a month to eight weeks the egg sac will be ready, and the King Baboon spiderlings should be incubated after five to eight weeks.